With the 2008-2009 football season officially upon us, I thought it was time to whip up a little add-on pack for my "I Love the Chicago Bears" freebie kit I gave away last month in anticipation of the new season. In week 1, my Bears lovingly ensured the Indianapolis Colts suffered a loss in their very first game ever played in their brand spankin' new Lucas Oil stadium. Being originally from the south side of the Hoosier capital gives me the right to rub it in a little bit, as the rivalry between the Colts and Bears is a big deal in my family, as I've mentioned before. While I watched the game in absolute glee all snuggled in on the couch with my boys, I have to admit I was super impressed with the new Colts stadium. It's really amazing! Anyway, hope you enjoy the little add-on pack. It includes 8 slide-type frames with various goodies -- some with complementary coloured masking tape, some with a little bracket stapled to it, and some that are just plain. You'll also find a separate journaling bracket, two cmdz doodle borders, two photo corners and 3 papers. 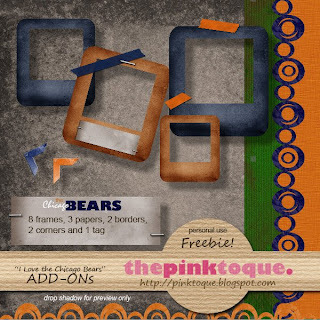 This add-on pack coordinates perfectly with my "I Love the Chicago Bears" freebie kit, and if you're new to the pink toque craft blog, you'll want to be sure and pop over to nab it from last month. And per usual, don't forget that all of my freebies are free for personal, non-commercial use only. Check out the TOU included with my downloads and don't hesitate to contact me if you have any questions. 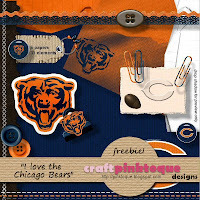 Download "I Love the Chicago Bears" Mini Add-On Pack HERE! Oh! And I almost forgot... come back tomorrow for a freebie QP I whipped up using this add-on pack :) You won't want to miss it! See you tomorrow, and GOOOOOOO BEARS! Thanks so much for both the kit and the add-on! I grew up in MW Indiana and the Bears where the favorite. Now I live southwest of Indianapolis and the Colts are the favorite. Can't believe I missed the game between the two. Thanks for the freebies.